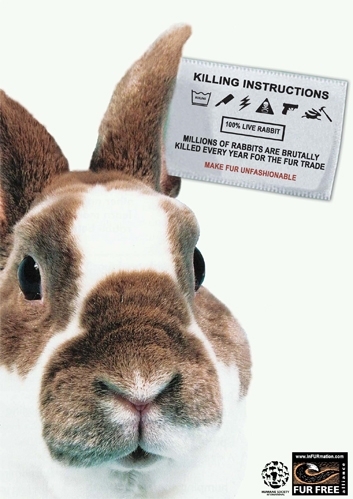 Rabbits who are killed for fur are raised on fur farms. Fur is not, contrary to popular opinion, a byproduct of the meat industry; because rabbits are killed for meat at a younger age than they are for fur, the rabbits who are raised for fur are raised and killed for an entirely different purpose and market than those in the meat industry. A typical fur farm contains hundreds of animals in wire cages in open sheds. The cages are barren, with the exception of nesting boxes for some animals for part or all of the year. With no protection from bitter cold and intense heat, these animals can perish from hypothermia and heatstroke. Several animals can be confined inside each cage. Conditions on fur farms are nothing short of appalling. Cages are often filthy, with piles of feces accruing underneath. The waste attracts flies and other insects, and animals are often infested with parasites such as fleas and ticks. Dirty living conditions can cause bronchial and nasal infections, as well as mastitis, uterine infections, and mucosal inflammations. The fur industry responds to the concerns of animal protection groups and the public by denying that such conditions exist. When shown undercover video of animals in fur farms, for instance, the industry has responded by maintaining that the videos are staged “snuff films” and that because the industry is regulated, no such abuse can exist. Yet there are no federal regulations regarding the treatment of animals while on the farm or during their slaughter. Intensive confinement on fur farms prevents the animals from engaging in virtually all of their natural behaviors, including digging, running, interacting socially, avoiding aggression or harassment, and foraging. This leads to a lifetime of intense frustration, which causes many animals to mutilate themselves, cannibalize their cage mates, or perform stereotypic behaviors such as compulsively pacing back and forth, bobbing their heads, or circling over and over. Some breeding animals may also kill their babies. Animals are ready for slaughter when they are about seven to ten months of age. Fur producers may kill animals in a variety of ways. They may break the necks of smaller animals such as rabbits. They may inject them with poison or pesticides; and the animals may gasp and cry out. The American Veterinary Medical Association (AVMA) has characterized the use of chloral hydrate as “unacceptable in dogs, cats, and small mammals.” Yet the fur industry maintains that it follows strict guidelines established by the American Veterinary Medical Association. Animals may also be gassed; up to fifty can be put into a single “killing box” at once and it is filled with carbon dioxide. Studies have documented animals trying to get out and gasping for air in these killing boxes. And producers may also use carbon monoxide from vehicle exhaust pipes, creating a prolonged, agonizing death for animals who struggle to escape and suffer convulsions.